First things first. Happy Election Day! I hope everyone is voting today no matter who you choose to vote for. Second, I hope everyone stayed safe and dry last week through hurricane Sandy. What a storm! I decided to play things safe and worked from home that day, even though my office was open for business. One of the great things about working from home is the ability to bake during my lunch break! 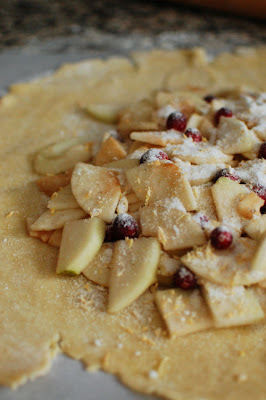 I was flipping through some recipes and this Apple, Pear, Cranberry Crostata caught my eye for a couple reasons. To learn more about this Apple, Pear, and Cranberry Crostata, head over to Cooking New England for the full post and recipe.